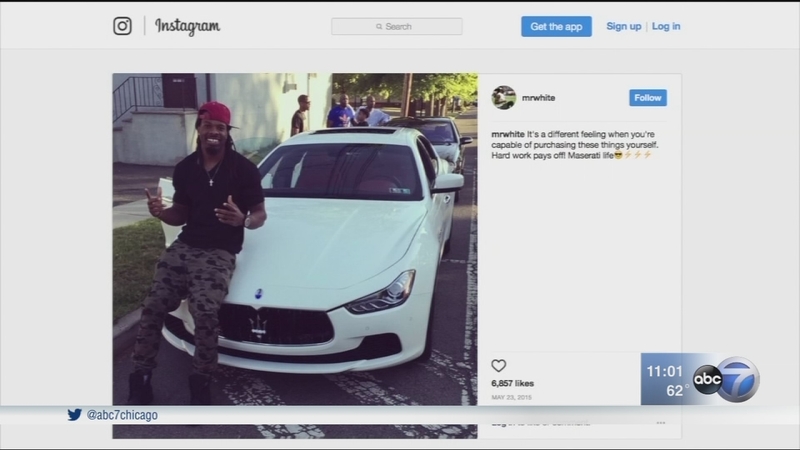 CHICAGO (WLS) -- Chicago police said they located a stolen Maserati on Friday that belonged to a Chicago football player. Police located the stolen car of Chicago Bear Kevin White on the 3800-block of West 16th Street. They said no one is in custody. Chicago police were tracking a number of so-called "bump-and-run" attacks. White's girlfriend was the latest target. Investigators called the Thursday night carjacking a well-rehearsed bump and run. The thieves got away with the wide receiver's white Maserati. White wasn't driving the luxury vehicle at the time. His 26-year-old girlfriend was alone in the car when it was stolen near West Grand Avenue and North May Street in the city's West Town neighborhood. Police said around 6:30 p.m., the thieves nudged her bumper at a stop sign to get her to come out of the car to check out the damage. Then two people jumped into the Maserati and took off, leaving the woman stranded. "This suggests a team of individuals doing this. One drives, both of them are in the car. Sometimes they use a female to bump the other car. If the female knows it's another female, then she gets out, lets her guard down, someone comes from behind, they jump in the car and they take off in the car," said Andrew Holmes, a community activist. "They'll hide the car in the garage somewhere until they can go do a drive-by or strong arm robbery with your vehicle and then they'll leave the vehicle. Sometimes the vehicle is found burned." White's girlfriend was not hurt. The robbery was the latest in a series of "bump-and-runs" or "bump-and-steals" on the Near West Side in recent weeks. - 1100 Block of South Racine Avenue on April 7, 2017 at 5:24 p.m.
- 400 Block of North Damen Avenue on April 10, 2017 at 7:30 p.m.
- 500 Block of North Ashland Avenue on April 23, 2017 at 3:50 p.m.
- 700 Block of West Roosevelt Road on April 24, 2017 at 9:25 a.m.
- 1000 Block of West 15th Street on April 24, 2017 at 9:45 a.m.
- 200 Block of North Ada Street on April 24, 2017 at 4:19 p.m.
- 500 Block of South Wood Street on May 10, 2017 at 5:35 p.m.
- 400 Block of May Street on May 11, 2017 6:38 p.m.
- 2200 Block of North Ashland on May 11, 2017 at 10:07 p.m.
Police said there are two or three offenders. They describe one as a black male, about 18-25 years old, with a dark complexion with a possible scar on face and cross tattoo on forehand. Another is described as a black male with black dreadlocks. "If this happens just let them go with it. They'll find it. Or just stay in your car, call 911 and drive to a lighted area," Holmes said.